The Kovarex enrichment process is a method for reprocessing uranium in a centrifuge. Although the process requires a large amount of the much rarer uranium-235 to start, it can be a good way to get more use out of the available uranium ore. Uranium processing takes 10 uranium ore and returns 1 uranium-235 with 0.007 (0.7%) probability, or 1 uranium-238 with 0.993 (99.3%) probability, leading to an expected (though not guaranteed) 1 unit of uranium-235 per approximately 143 processing cycles (or about a 1:142 ratio of U-235 to U-238). This is currently the only probability-based crafting recipe in the game. Uranium-235 is necessary to create uranium fuel cells and atomic bombs, in considerable quantities for the latter, but the probability distribution of uranium processing leads to it being produced slowly and creating large stockpiles of U-238 as a byproduct. 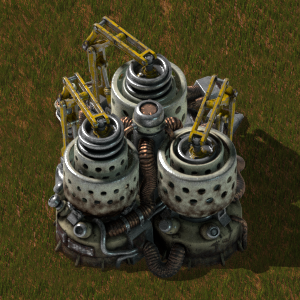 The Kovarex process thus provides the player with a considerably faster (and deterministic) method of producing U-235, as well as a use for the surplus U-238. Unlike all other crafting processes in the game, uranium processing creates U-235 and U-238 based on probability, rather than in guaranteed deterministic amounts. Additionally, the Kovarex process requires a bulk stockpile of 40 units of the rare uranium-235 isotope to initiate in a single centrifuge. Therefore, planning uranium mining and processing for the Kovarex process takes certain considerations not encountered elsewhere in the game. As U-235 is created in centrifuges running uranium processing with p = 0.007, the expected number of processing cycles to gain a single unit is E(1,p) = 1 ÷ p = ~143. The expected number of cycles to gain 40 units is then E(40,p) = 40 × E(1,p) = ~5,714 cycles. Note that running this many cycles requires mining 57,140 uranium ore, a non-trivial task. 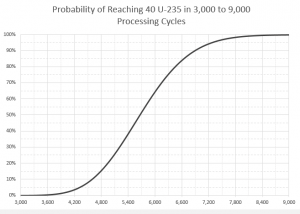 However, given the nature of probability, it is impossible to guarantee that 40 units will be reached in this number of cycles; as a matter of fact, some mathematics yields that the probability that 5,714 cycles will produce at least 40 units of U-235 is only about 52%. Some further mathematics enables one to calculate the number of uranium processing cycles one must run to obtain at least 40 units of U-235 (given p = 0.007) with a given level of confidence (probability of achieving the set goal). As discussed in the previous section, the level of confidence corresponding to 5,714 cycles (for which the expected value of U-235 gained is 40) happens to be about 52% (or, in other words, with this number of cycles, one can expect to fail to reach 40 U-235 a bit less than once out of every 2 tries). Some further example confidence levels that may be of interest to players are given in the table below. Consult the chart to the right for custom values. In the real world, uranium-235 is the only fissile isotope of uranium and makes up approximately 0.72% of naturally-occurring uranium, with the other 99.28% being uranium-238. The in-game representation is thus highly accurate in this regard. Uranium is commonly enriched in centrifuges to increase the percentage of 235U for use in fission reactions. Uranium munitions are made from depleted uranium, a byproduct of uranium enrichment, which is mostly 238U whose natural admixture of the 235U isotope has been lowered even further through the enrichment process. Depleted uranium is minimally radioactive and the reason for its use in munitions is its very high density and other mechanical properties, not radioactivity/toxicity. Can be used with productivity modules once again. Use with productivity modules now gives correct amount of bonus items. No longer usable with productivity modules. This page was last edited on 13 April 2019, at 05:25.